Musicians from the concert hall to the living room utilizing their talent and passion to improve the quality of life in their community: this idea is the guiding principle behind the Citizen Musician Initiative. Led by Judson and Joyce Green Creative Consultant Yo-Yo Ma and spearheaded by the Chicago Symphony Orchestra (CSO) this initiative, formalized in 2011, is not just a program or project, it is a way of thinking. “As a musician, you are always working toward something larger than yourself. Musicians balance in mind both the biggest conceivable picture of the world and the most minute sensitivity to their present position in it. These three values have guided the projects by the CSO, the Civic Orchestra of Chicago (Chicago’s Youth Symphony) and partners throughout Chicago and around the world. 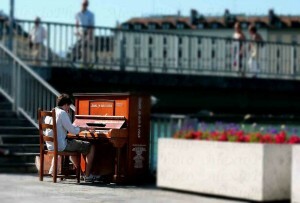 This initiative encourages ensembles and individuals to perform in unusual community settings and collaborate within communities that do not have regular access to performances; share ideas and experiences to build the knowledge of community engagement through music; and encourages individuals to pursue their unique musical interests. Musicians past and present have been doing this work, but the Citizen Musician Initiative is an effort to recognize, celebrate and increase awareness about musicians who work to enrich the lives of those around them through collaboration, connection and conversation. Citizen musicians are recognized as individuals who work collaboratively within the community whether through an educational institution or by partnering with neighbors to serve an existing need or solve a problem. They also build connections and relationships with audience members and partners to understand how their work can best nurture the community. Finally, citizen musicians engage in dialogue and discussion about the process of the projects they lead. Actively listening to the successes and challenges of diverse projects, citizen musicians can build a working knowledge around best practices for engagement and collaboration. Since this initiative works to recognize citizen musicians from around the world, the format for doing so is digital. Through the Citizen Musician website individuals can register themselves or nominate others as outstanding citizen musicians. There are currently musicians from all walks of life registered on the site: professional to amateur, classical to folk, and young to old. Through these profiles, individuals offer stories about significant programs or projects they are working on and connect with others doing similar work. The website also provides links to events by citizen musicians primarily in Chicago and news articles about the effects of music on the human experience. By recognizing the work done by citizen musicians. this initiative has begun quantifying the effect that musicians engaged in community work can have on the quality of life in their neighborhoods and cities. As this initiative continues to grow it will help individuals connect their creativity to community citizenship. A musician cannot register without listing a state within the US. Many fine American musicians live abroad. It seems a shame for them to be excluded from the Citizen Musician Initiative.